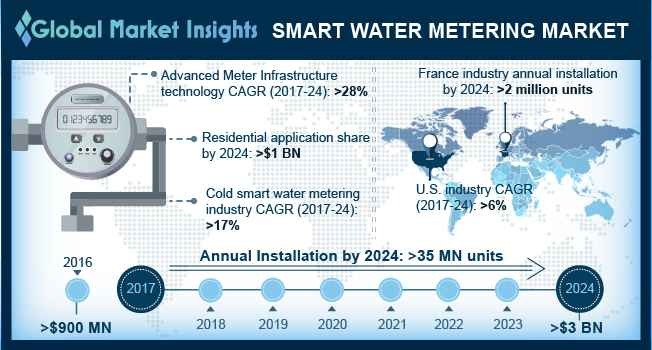 Smart Water Metering Market size will exceed USD 3 Billion by 2024, as reported in the latest study by Global Market Insights, Inc. Adequate measures toward monitoring Non-Revenue Water (NRW) coupled with effective mapping of water resources will boost the smart water metering market. Increasing efforts to improve the efficiency of water networks and adequate addressing of unbilled water consumption will further enhance the business landscape. For instance, according to International Energy Agency (IEA), an average of over 34% of pumped water is lost as NRW as a result of theft, tampering, meter inaccuracy and faulty distribution networks.